1600 Jo and I arrived at Owl Harbor with clear sky's, light, dry winds from the North and 100 degrees temperatures. By 1700 we had Pegasus stocked for the Triton Rendezvous to be held in Potato Slough and was looking for ways to beat the heat. Jo headed for some shade while I grabbed the hose and started washing down the decks (and me) with cool water. 1730 A trickle of wind coming from the NW caught my attention. Could this be heaven (or what the weather man calls: A Delta Breeze?) By 1800 the winds had increased to 20-25 and the temperature dropped 20 degrees. During the night, the local weather station reported gusts to 40 MPH. The Rendezvous would indeed be a sail in. 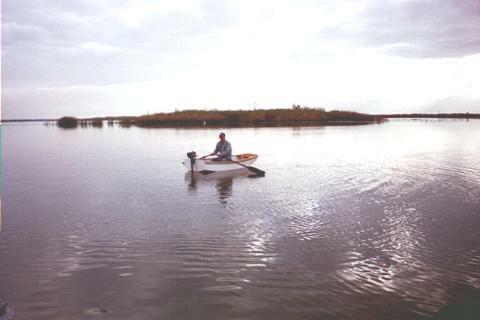 0900 Jo and I sailed out of Sevenmile Slough in light winds towing our hard dink. After reaching the second island (Bedroom #2) we selected a location that would accommodate a half dozen boats or so and tied the bow off to a willow tree. A stern anchor was set to hold us steady during the current changes. I slipped over the side with by bottom brush and started cleaning while Jo worked on the topsides. Soon, we were joined by the Petersens (previous owners of the Triton Arbenture) in their new power boat. 1530 While discussing some of our more memorable cruises with the Petersens, a sail boat with a profile born in heaven rounded the southern end of the island (opposite of the instructions.) It was Anake skippered by Mark Harrington, followed by Head Over Heels strutting her blue water abilities with Rob Squire at the helm. Last but certainly not least, came Juno. At first I was unable to determine who was in charge of Juno however, it became readily apparent that the Top Dog was a good looking female by the name of Kodi. 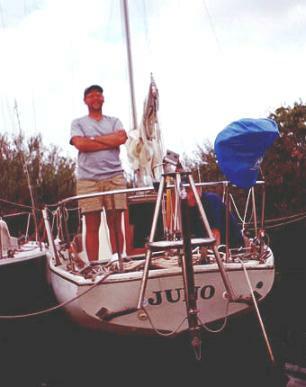 Also on board was Juno's owner (and Navigator?) Steve Cossman and the Triton cruising clubs favorite crew and friend, Owen. Unmistakably, the 3 Triton's were looking for a little realization after 2 days of sailing from San Francisco Bay. So much for serenity! Rob was the first to raft up next to the Petersens. He immediately got out the Macintosh, slide rule, steel tape, fenders and line to orchestrate securing Anake and Juno to the growing raft. And, I might add did an excellent job. Not one spreader touched, the path was clear form boat to boat and it was all accomplished without one beer (not a common feat in the Delta ;-) However, with the hard work done for the day, the crew gathered on Arbenture II to share the journeys stories and a cool beer or two. 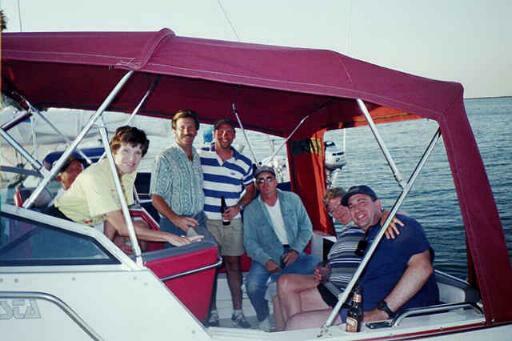 The rest of the day was spent inspecting each boat for new ideas, munching, drinking beer, telling stories, inspecting each boat for new ideas, munching, drinking beer, telling stories, oh well, you get the idea. Thursday nights potluck started with finger food, wine and cocktails followed by a banquet for champions. Far more food, beverage and camaraderie than the average Delta Dawdler can handle. It was a super evening! Just about everyone was relaxed and enjoying an afternoon of frantic inactivity. "Just about everyone" because when Steve was not rowing Kodi to and from the levy he had to stand guard over his wind vane to ensure Delta Snatchers didn't make off with it. However, it was soon learned that the common culprit trying to slip away with the SS plumbing system was our own Mark who Steve sent to Devils Island and solitary confinement for his crimes. 1000 By mid morning everyone had slid into the lazy routine demand by the Delta when, around the Island came another one of those beautiful sheer lines with a Fatty Knees on a leash. 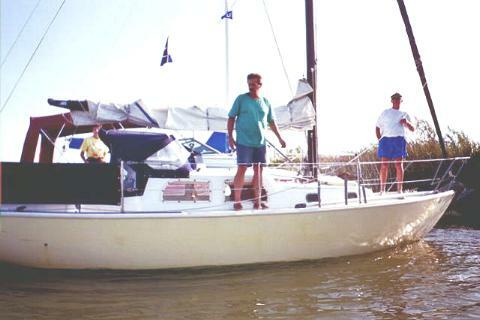 White Cap, #3, Skippered by Skip Baker journeyed down the San Joaquine River from Stockton the night before but was unwilling to navigate the sloughs after dark (wise decision.) 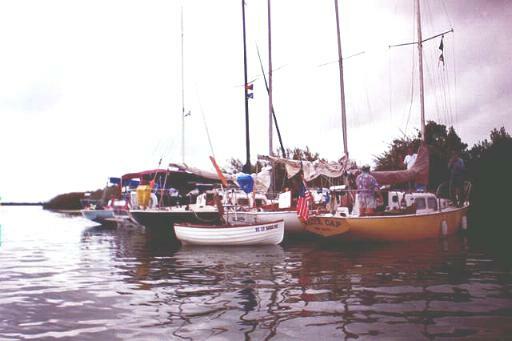 At first light, he again made way to give the Delta Rendezvous a total of six boats and five Triton's. 1500 The raft broke and headed for Owl Harbor and a sit down Dinner where we were joined by Rob's wife Marilyn, Marks first mate Dixie and Larry & Joyce Suter. I ran out of film at the Island so you guys will have to hope someone else documented the end of the story. After dinner, the night was spent in a slip (albeit rickety) while the crews made ready for their 50 mile beat back to the Bay. This group of wandering Triton's are a great bunch that Jo & I always enjoy spending some time with on the hook, in a slip or, tied off to a willow tree. If you missed this cruise, you missed an enjoyable time - We're glad we didn't. See you at the next cruise. I am happy to report that WC #141 Formerly "Ebb-Tide" arrived in Santa Barbara, CA on 11/6 after a harrowing final jaunt from Morro Bay. We began the journey in San Francisco last month. Ebb sailed through gales and giant seas and never let us down. OK, the A-4 let us down but you can't hold that against the vessel's high quality and strength. Aside from being a classic, the Triton is truly a remarkable boat as we have learned first hand since the majority of our voyage took place under adverse weather conditions. I can't say enough about how amazing the Triton is. 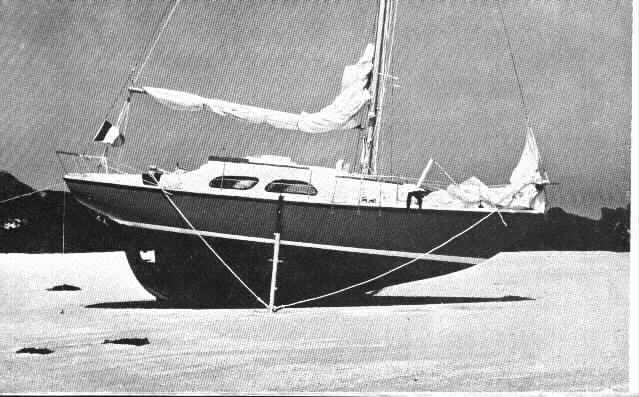 Philippe de Bersunder on Cruising Northern Africa in his French Triton "ORION"
I haven't any pictures of Orion with me here at home. In fact, I have only an old computer, 2 pair of pants and 2 shirts, along with some parts I bought for Orion, like a windvane, winches, etc. All the rest of my stuff is on Orion. Orion is currently south of Spain, where she will remain for six months. I plan to go back aboard as soon as possible, it's just a question of money. I'll put pictures of Orion on my Triton pages next month if time permits. There are Internet Cafés everywhere in Spain, from which I update my web site. size of the boat by doing a "skirt" (that I think is not a good idea, but...). He has also changed the sails to do a kind of Mediterranean lateen configuration. I haven't seen him for about a year, so I'm curious to see the result. I do know of two other French Tritons on south coast, but I do not know their owners. 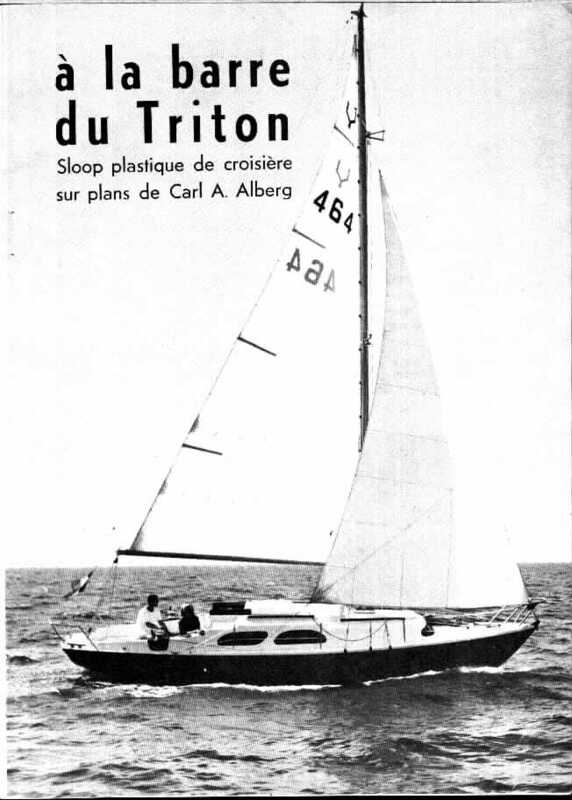 Tritons have not been listed for sale in the major French boating magazines, like "Bateaux" for many years. About my trips, the main thing to retain is that Triton is a very strong boat, because most of the time I have had bad weather in Mediterranean. In this area, the winds changed very fast and there are sudden storms or depressions, followed or preceded by mirror calms. I met waves 2 to 3 meters (7 to 10 feet) high while crossing the sea south of Sardinia during the summer. My last trip was in November from Sousse, Tunisia along Algeria to a small marina near Almeria, Spain; I had a very difficult passage (waves passing above the cabin, and snow). I stopped near Almeria because one of Orion's stays started to break. As the boat is 34 years old, I decided to take a general look everywhere, and to change what was needed. About the countries, Tunisia is nice, quiete and cheap - but it seems to have been turning bad for some years. Too many police and some political problems. Algeria is still very very dangerous because of Muslim terrorism, even if there are police and the army everywhere. It's better not to go to Algeria, even to get cheap gas. In case of a big problem the best place to go is the port of Alger only or to Dellys, 40 miles to the East, but you go at your own risk. The only positive point is that the gas is very very cheap. Apart from the one week I spent here to buy gas and food, 2 or 3 days to change 40$ with the bank office. People you meet (policeman, customs, etc) are quite sympathetic. But there are terrorist and invisible killers around, and it's not a joke. Sardinia is good to see, like Malta, but a little bit expensive.